Well, another year and indeed decade is nearly over, so as I take my customary Christmas break I’d like to take this opportunity to wish all of you a very Merry Christmas and a Happy New Year. It’s been a fun year for me, my first full year of being a parent, and I’m really looking forward to enjoying Christmas this year with my wife and daughter. Hopefully this year she’ll be old enough to realise that unwrapping presents is fun! So with 2010 just around the corner, I have to ask, what will this new decade be called for short? After all, Eighties, Nineties and even Noughties are fairly obvious abbreviations, but the Tens doesn’t sound quite right, does it? See you in the New Year with more Eighties related fun and games! 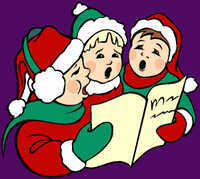 One of the things I’ve always liked about Christmas is the singing of Christmas Carols. My earliest memories of singing Christmas Carols at primary school were of the whole school going into the assembly hall and singing carols, with the words provided thanks to the schools overhead projector and some acetate sheets. Whilst I enjoyed (and still do enjoy) listening to and singing good old traditional Christmas songs, I also remember that I used to find the alternative lyrics, that somehow all kids end up knowing, quite amusing. So, in honour of those funny lyrics, here are my favourite messed about with Christmas songs, but if you know any others, then please leave them in a comment on this post! And said I beg your pardon. Congratulations to you Solange and you should receive your prize very soon. 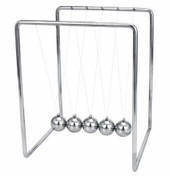 It isn’t certain when the Newton’s Cradle was actually invented, but it was probably in the late 1960’s. Whilst named after Sir Isaac Newton, he certainly had nothing to do with its actual creation, other than through discovering gravity and his work on understanding the laws of physics of course. The Newton’s Cradle was the invention that really started the idea of the “Executive Toy”, something that someone in a high position in a business wouldn’t be afraid to have on their desk as an idle distraction from their busy work schedule. Nowadays there are a whole range of such gizmos, but it was only in the Eighties, with the rise of the Yuppie and their disposable income that such trivialities became really popular. So what is a Newton’s Cradle. Put simply it is little more than five balls suspended from a frame, but it is also a great tool for explaining gravity, pendulum motion and the principal of conservation of energy and momentum. Pulling one of the balls aside and letting it drop into the others transfers all it’s energy through the remaining balls onto the last one, which then swings up into the air, only to drop down and repeat. Father Christmas or Santa Claus FTW? Yesterday I wrote about how when I was growing up the name Father Christmas slowly seemed to be replaced by the name Santa Claus. Today’s survey is really quick and simple then. Which of these two names do you prefer for the white bearded one? 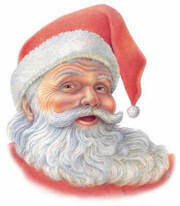 When did Father Christmas become Santa Claus? You may know him as Saint Nicholas, Kris Kringle or Annual Gift Man (if you believe the writers of The Simpsons) but when I was very little the jolly fat man in the red suit was always known as Father Christmas. At some point during my childhood though, the name Santa Claus started to rise in popularity, probably due to the way that British TV gradually started to become much more Americanised. This makes me wonder how many young children in the UK today know only the name Santa Claus, and whether it’s just that Santa Claus seems a little bit more “grown up” sounding than Father Christmas, so older children feel less babyish with this name? Anyway, this was an idle musing of mine, but I thought it would be an interesting one for you to mull over. Tomorrow’s survey will be asking you which name you personally prefer, so have a little think and come back tomorrow to cast your vote. In the meantime, I’d love to hear your feelings about this, so why not post a comment below. 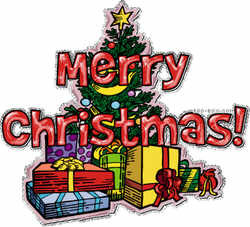 Traditionally, if you have been naughty, Father Christmas would just leave you a piece of coal. Try getting that to play on your Nintendo Wii. Depending on where you live, his home could either be at the North Pole or perhaps Lapland, although every Nordic country lays claim to his residence and magical toy factory being situated within it’s borders. In 2008, Canada officially awarded Santa with Canadian citizenship, since the North Pole is apparently under Canadian jurisdiction. When writing your letter to Santa, don’t forget the postcode, which is H0H 0H0 (look at it carefully!). This is the official Canadian postcode for the North Pole! The traditional red and white suit was cemented in history thanks to Coca Cola, who have been using this image since the 1930’s to advertise their beverage. Presumably he was given red and white to tie in with the soft drink can colours? Following on from the Rubik Cube themed goodie list I posted a little while back, I’d now like to present a list of interesting and quirky Lego related gifts. Thanks to my wife for spotting the first of these in the Metro newspaper, which is the Lego Wallet. These wallets are built to order by hand, and the bricks are glued together so it won’t keep coming apart in your pocket. You can choose from a wallet made with either two Lego baseplates for the sides, or for a slightly thicker wallet the sides can be constructed from a variety of different coloured Lego bricks. The wallet opens via a sturdy zip which is glued to the two sides, which makes sense as I don’t think making the entire thing out of Lego would be that good an idea. They are available direct from ColorByNumbers, although last orders for Christmas have passed already unfortunately. Still, it’ll make a good next years birthday gift! My next Lego inspired item is great for those who love to play in the kitchen! The Lego minifigure kitchen scales. They are made in the shape of a giant Lego man head, complete with comedy moustache! The scales can weigh in both metric and imperial, and will make weighing out ingredients when cooking a bit more entertaining. There are a number of classic chocolate bars aimed mainly at younger children (those of around primary school age) which have stood the test of time. These are the bars that I’m sure you all remember loving as a child, but for some reason as an adult you find yourself ignoring them when you’re looking at the chocolate shelf in a newsagent or supermarket. Milky Way, Chocolate Buttons and Smarties are three good examples (although poor old Smarties have been somewhat usurped by M&Ms now, and they’ve got rid of the old round tube with the plastic lid with a letter on it) but today’s post is about the Cadbury Fudge, or Finger of Fudge as I always believed it was called when I was little thanks to the TV advertising. It’s a simple but effective sweet. A long thin log of fudge coated in Cadbury chocolate, it had a nice creamy taste and best of all wasn’t an expensive chocolate bar. The TV advert embedded below claimed the cost to be 10 pence, but I’m not sure what year this would have been. The good news is that the Finger of Fudge doesn’t appear to have raised much in price over the years either, as it still only costs 15 pence today. Indeed you can buy a box of 60 from A Quarter Of for less than a tenner!